But Why Is the Toilet Leaking Around the Base in the First Place? Before we get into the reasons you have these leaks, we need to give you two pieces of advice: First, shut off the water flow on the feedline by turning the valve. This will help stem further water loss. Second, soak up as much water as you can from the base to help prevent water damage and the spread of bacteria. A Worn-Down Wax Ring: This is one of the most common causes of leaking around the toilets base. The wax ring seals off water from leaking out of the drainpipe. The ring can shrivel down, and if this happens the ring must be replaced. The ring itself isn’t expensive. However, the toilet must first be removed from the floor, and this is something you only want a professional plumber to handle. 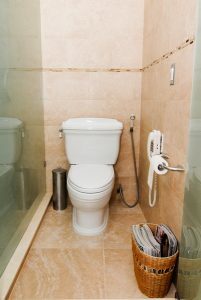 The plumber will safely remove the toilet, put in the new ring, and seal the toilet back to the floor with caulking and make sure the drain is reconnected. Loose Tee Bolts: The toilet may have come loose from the floor, or perhaps it was always loose from when it was first installed. The tee bolts on the toilet’s base can be tightened to solve this. These are the bolts found under the plastic caps on the two sides of the toilet’s base. But you need to be careful because the tee bolts can be too tight, which will crush the wax ring (and the wax ring won’t spring back) or even break it, making the problem worse. If you have doubts about fiddling with the tee bolts, please call for a plumber. Cracks in the Bowl: If you see water around the toilet base, it doesn’t necessarily mean the source of the leak is from the base itself. It may be coming from cracks in the porcelain, which are flowing down the sides of the bowl and onto the floor. If water is leaking from cracks, it means the entire toilet must be replaced. If you need a bathroom toilet repair done fast, call us for 24-hour plumbing in San Bernardino, CA or elsewhere in Southern California. We will have any bathroom plumbing problem solved fast, and solved permanently. Need your repairs for your bathroom plumbing? Call on Sweetwater Plumbing—we’re always open for business!